A U.S. flag is displayed at a military housing unit inside of Bagram Air Field, Parwan province of Afghanistan, Jan. 2, 2015. The continued U.S. presence there has gotten little attention in the presidential campaign back home. During Barack Obama’s first presidential campaign, the then-senator argued that the war in Afghanistan had been neglected because of the U.S. invasion of Iraq. "And that is why, as president, I will make the fight against al-Qaida and the Taliban the top priority that it should be. This is a war we have to win," Obama said in 2008. Eight years later, after surging 100,000 U.S. troops into Afghanistan and then scaling back to fewer than 10,000, there is little talk of “winning” the war. The Afghan government continues to struggle against a resilient Taliban insurgency. And Obama says his successor will determine the next U.S. move. But neither Democratic presidential nominee Hillary Clinton nor Republican Donald Trump has outlined what they plan to do. Indeed, over the past year the war itself has barely been mentioned by the candidates. Although the United States has dramatically scaled back the number of American troops in Afghanistan, the U.S. remains deeply involved. Obama requested $3.45 billion in the 2017 budget to help fund Afghan security forces. He recommended that his successor maintain funding at that level through 2020. U.S. military trainers continue to advise Afghan forces, and U.S. warplanes carry out strikes to help Afghan units fighting on the ground. Clinton has said she supports Obama’s troop draw down, but has offered little else about what she plans to do if she becomes president. Hillary Clinton has said she supports Obama’s troop draw down but has offered little else about what she plans to do if she becomes president. Her campaign website does not mention any plans for Afghanistan. Last November, during a speech focused on the Islamic State extremist group, she suggested that Afghanistan should take more responsibility for its own security. Clinton did not mention the war in her sweeping policy speech when she accepted her party’s nomination for president. Her campaign website, which contains policy papers on a wide range of issues, does not mention any plans for Afghanistan. Trump has been more direct about his thoughts on Afghanistan, at times calling for a complete withdrawal. In January 2013, he tweeted the U.S. should leave Afghanistan immediately. Last October, Trump told CNN that the war in Afghanistan was a mistake and he feared the U.S will get stuck there. Later that month, Trump told CNN he did not believe Afghanistan was a mistake and rather the U.S should not have involved itself in Iraq. Donald Trump has been more direct about his thoughts on Afghanistan at times calling for a complete withdrawal. Last October, he told CNN the war in Afghanistan was a mistake and he feared the U.S will get stuck there. 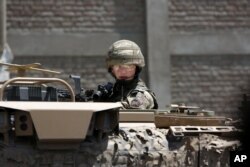 Afghanistan ‘better off’ without U.S. attention? John C. Fortier, the director of Democracy Project at Bipartisan Policy Center, believes that the past focus on Afghanistan had much to do with the political debate over whether the war in Iraq was a mistake that spread the U.S. military too thin, increasing the challenge in Afghanistan. “To go back to 2008, I think our role in Afghanistan played a significant role in the campaign in part because at the time [President] Bush was unpopular, and the argument from Democrats in general and from President Obama in particular was the Iraq war has not gone as well and is not a war we should have done and the Afghanistan situation is one where we should’ve exercised force,” Fortier said. Republicans have criticized Obama’s handling of Afghanistan in recent years in part for his decision to announce the gradual withdrawal of U.S. troops from the country, which they said signaled to the Taliban that Washington is not committed to the war effort. However, Michael O’Hanlon, director of research for foreign policy at the Brookings Institution, told VOA that even critics of Obama's policy do not offer much in the way of alternative policies. FILE - Afghan National Army troops arrive in Nad Ali district of Helmand province, southern Afghanistan, Aug. 10, 2016. President Obama requested $3.45 billion in the 2017 budget to help fund Afghan security forces. "Even though no one is happy that the U.S is reaching its 15th year mark in Afghanistan, it’s not as if anybody has great ideas for either totally pulling out or for beefing the force way back up,” O’Hanlon said. O'Hanlon says, though, that the war's lower profile this campaign season is not all bad. “As a person who supports the mission in [Afghanistan], I am actually glad that it is not getting the attention because I am not sure that more attention could actually improve the quality of the debate. It might lead someone to say he or she is going to end the mission in an effort to try to be more dramatic than the opponent and that could lead to some bad policy outcomes,” he said. At a time when threats from Islamic State terrorists, the war in Syria and tensions with Russia and China are the foremost foreign policy priorities for the U.S., some say it's only natural for U.S. officials to focus less on the Afghan conflict. “Now Afghanistan is competing [for attention] with a lot of other countries where the U.S is engaged," said Seth Jones, the director of the International Security and Defense Policy Center at Rand Corporation. "It is obviously competing with Iraq which is getting a lot of attention, it’s competing with Syria, it is competing with U.S. operations in Libya, it’s competing with the terrorism issue in Europe with the attacks in Paris, Brussels, Turkey and other locations." A British soldier guards a site near Kabul's international airport in Kabul, Afghanistan, May 17, 2015. Declining U.S. interest in the war reflects in part the declining number of U.S. casualties there. Declining U.S. interest in the war reflects, in part, the fact that there are far fewer Americans in Afghanistan, and U.S. combat-related casualties have fallen to just eight troops killed since the start of this year. Thomas H. Johnson, the director of the Program for Culture & Conflict Studies at the Naval Postgraduate School, makes that point. “If you take a look at both Republicans and Democrats primary debates, Afghanistan is, I think, only mentioned once or twice and the Republican candidate Trump knows very little about Afghanistan. I have seen only one interview where he was asked anything about Afghanistan and his basic response was Afghanistan is really not the problem, Pakistan is,” Johnson said. Johnson said Clinton and her team have not really focused on Afghanistan either, partly due to a string of international terror attacks by Islamic State that have captured the public's attention. But, he said, Islamic State's emergence in Afghanistan about a year ago might help push Afghanistan back to the center of the U.S. policy debate. The security situation in Afghanistan remains perilous, and the government remains weak. U.S. military analysts said in a report earlier this year that the government lost control or influence of nearly five percent of its territory between January and May. A top U.S. commander said Afghan forces suffered more than 900 fatalities in July alone. Afghan President Ashraf Ghani, center, speaks with U.S. President Barack Obama and NATO Secretary General Jens Stoltenberg at the NATO summit in Warsaw, Poland, July 9, 2016. That month, Afghanistan's President Ashraf Ghani gathered with top officials from NATO countries in Warsaw to discuss the country's future. A joint statement reaffirmed a "mutual commitment to ensure long-term security and stability in Afghanistan" and said "Afghanistan will not stand alone." "Our aim remains that Afghanistan will never again become a safe haven for terrorists ... and that it is able to sustain its own security, governance, and economy and social development, while respecting human rights for all of its citizens," the statement said. Ghani told the gathering that the country will move forward, with help. "With your resolute support, we will redouble our efforts to create a democratic constitutional order and an accountable and effective state that can bring peace to our people and secure our future from the menace of terrorism," he said. The United States remains a key part of that effort, but with little discussion of their plans during the U.S. campaign, it is unclear how long that will remain the case under either a Clinton or Trump administration. Correction: A photo caption in an earlier draft of this story mistakenly identified a British soldier as an American one. VOA regrets the error.